A memoir on making the Starbenders Time Stops music video by Benjamin Roberds, Director at Dominar Films. It was two o’clock in the morning, crawling across the rusty floor of an abandoned 1920s train car where I realized we were dead in the water. For fifteen minutes myself and the entire crew had all been searching for one tiny screw, no bigger than the tip of a pencil. Fifteen minutes can feel like an eternity when you have a crew of ten tired people, four ballerinas, a rock band and two booming generators. They rattled the entire train as if it were moving like it did nearly a hundred years ago. We had been shooting since noon using a custom built 65 foot motorized dolly system that worked beautifully until now, the second to last shot when one tiny screw flew out of the wheel and into the heart of the project like a bullet. We had to accept it, the screw that had been ordered online, was now gone and there was no way to find one exactly like it in Hartwell, Georgia at two in the morning. Our dedicated Producer Katie Gregg desperately shuffled through tool boxes trying to find another practically microscopic screw, but no luck. Katie had built the dolly from scratch and with the delay of parts arriving before the shoot date, she was able to manufacture it just in time. Unfortunately with the time constraints, we couldn’t have anticipated that tiny screw wiggling it’s way out. Now the dolly lay motionless like the old train car itself. Within two minutes of hearing Time Stops, I knew I wanted the video to take place in an abandoned train. I proceeded to spend the next two months trying to convince myself it couldn’t. We didn’t have the budget or resources. We especially didn’t have a train. After many brisk walks through Athens, Georgia with messy hair, a cup of coffee and a pair of headphones desperately trying to come up with a plan B, I gave up on giving up the idea. Katie and I decided to find a train. After days of scrolling across the countryside on Google maps looking for train shaped objects, emailing train museums and driving down back roads, eventually a tip from a friend led us to Hartwell, Georgia. 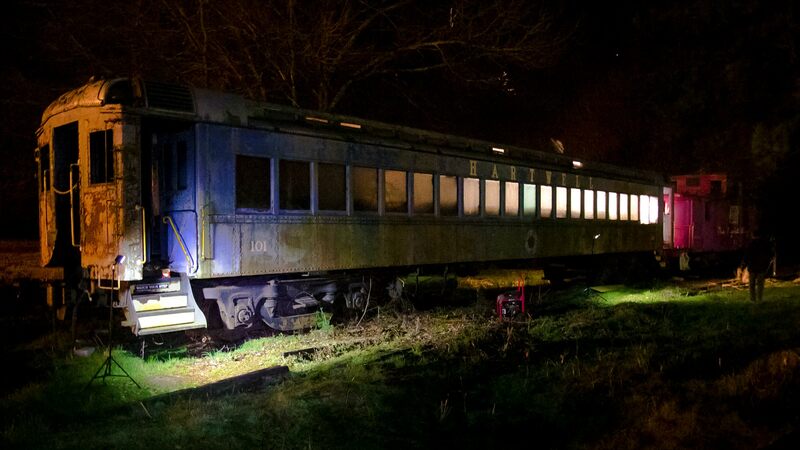 Only an hour away from Athens, Hartwell was home to an abandoned passenger train car from the 1920s. It sat lonely and forgotten in a field behind a bank. Wasps buzzed throughout the rusty dilapidated carriage and cold January air whistled through shattered windows. It was perfect. We spoke to the city and luckily they were excited as we were about shooting a video in the old train. Now that we had a location, we put together a treatment for the band. Starbenders loved the idea. Lead singer, Kimi Shelter had seen pictures of the train on our Instagram and had hoped we were scouting it for her video. We locked down a shoot date and the real work began. Although I had envisioned the video traveling through an entire train, we only had one train car. In order to make the illusion of one endless shot, we’d need to keep the camera moving at a precise steady pace and transition using VFX masks for the dark parts and hang a green screen during the day. We’d need to build a custom dolly system. While Katie began designing the dolly, I started talking through the logistics with our DP, Bryan and AD, Diego Kirsch. They accepted the challenge with enthusiasm and readied themselves for a monster of a shoot. Katie found blueprints of the old train so I could mark up every shot from above. Slowly the plan came together and quickly the shoot date approached. The train had no nearby power source so we’d need generators for the lights and an RV for restroom/greenroom. We needed four ballerinas, four custom made mirror masks, twelve extras, 130 feet of sanded/painted PVC pipe for the dolly system, 8 lanterns and much more. Katie and I had a lot of work to do. To me, preproduction has always felt like parallel parking a car at high speed and this time we were driving very fast. As cars lined up in the grass, my phone pinged with the final ballerina confirming her availability for that evening. I had spent the night in the RV next to the train and woken up early to gather more supplies and gas for the generators. The dolly system had a few last minute malfunctions. Katie had to frantically find a replacement motor and our 2nd AD Josh Miller had to sand down the metal piece attaching it to the wheel and drill it together. The first shot of the day would be the dolly system’s first real test. From the ground up Katie’s rig consisted of 8 roller blade wheels screwed onto brackets, drilled into a piece of plywood with a 195RPM gearmotor affixed to one of the wheels and powered by a battery pack. On top of the plywood sat a tripod holding an upside down DJI Ronin where our GH4 camera sat steady on top with a 14mm Rokinon lens. I had made song clips with loud beeps to signal the start for the dolly on loud speakers on one end of the train car. With Bryan sitting in for Kimi and the crew looking on anxiously, the speakers began to beep. On the third beep, I turned on the battery pack sending the dolly down the aisle on it’s own at medium speed. It was moving but not fast enough. We switched it to full speed, quickly reset and pressed the power button smoothly sending it across the 65 feet of dolly track in less than a minute. We celebrated briefly then jumped into action!